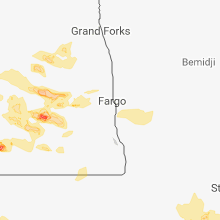 The Hunter, ND area has had 1 report of on-the-ground hail by trained spotters, and has been under severe weather warnings 23 times during the past 12 months. 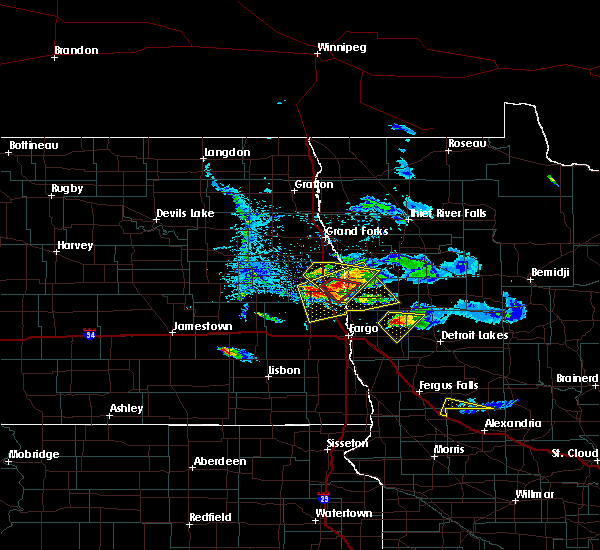 Doppler radar has detected hail at or near Hunter, ND on 25 occasions, including 5 occasions during the past year. 6/29/2018 4:26 AM CDT At 425 am cdt, severe thunderstorms were located along a line extending from crookston to near lockhart to brooktree park, moving east at 65 mph. these are very dangerous storms (public). Hazards include 80 mph wind gusts and penny size hail. Flying debris will be dangerous to those caught without shelter. mobile homes will be heavily damaged. expect considerable damage to roofs, windows, and vehicles. extensive tree damage and power outages are likely. these severe storms will be near, lockhart, crookston and harold around 430 am cdt. 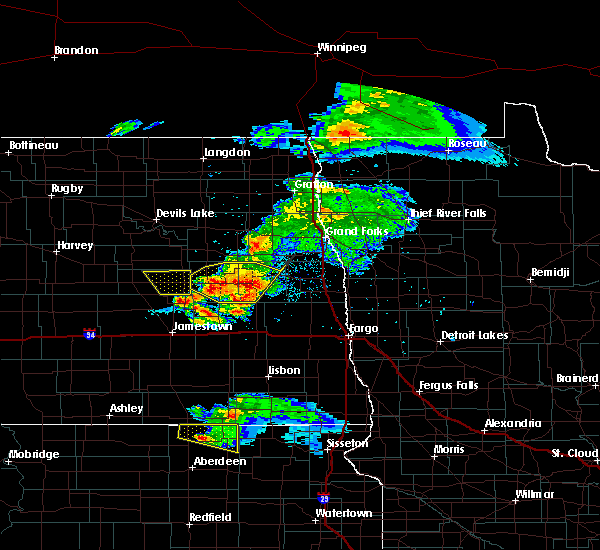 felton and borup around 445 am cdt. other locations impacted by these severe thunderstorms include west argusville and american crystal sugar. this includes interstate 29 between mile markers 71 and 116. This storm has a history of producing wind damage. 6/29/2018 4:11 AM CDT At 410 am cdt, severe thunderstorms were located along a line extending from near reynolds to kelso to amenia, moving east at 60 mph. these are very dangerous storms (radar indicated). Hazards include 80 mph wind gusts and penny size hail. Flying debris will be dangerous to those caught without shelter. mobile homes will be heavily damaged. expect considerable damage to roofs, windows, and vehicles. extensive tree damage and power outages are likely. 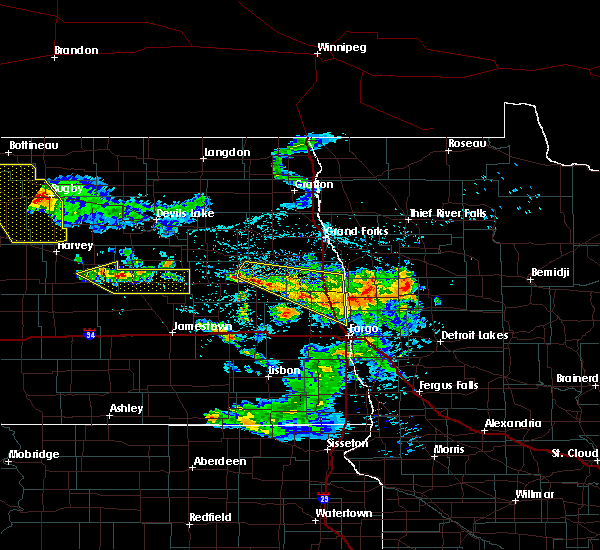 these severe storms will be near, halstad, hendrum and climax around 420 am cdt. brooktree park, argusville and harwood around 425 am cdt. georgetown, kragnes and north river around 430 am cdt. ada, hadler and harold around 435 am cdt. averill around 440 am cdt. other locations impacted by these severe thunderstorms include west argusville and american crystal sugar. This includes interstate 29 between mile markers 70 and 130. 6/29/2018 3:51 AM CDT At 350 am cdt, severe thunderstorms were located along a line extending from near hatton to galesburg to near tower city, moving east at 60 mph (radar indicated). Hazards include 70 mph wind gusts and penny size hail. Expect considerable tree damage. damage is likely to mobile homes, roofs, and outbuildings. 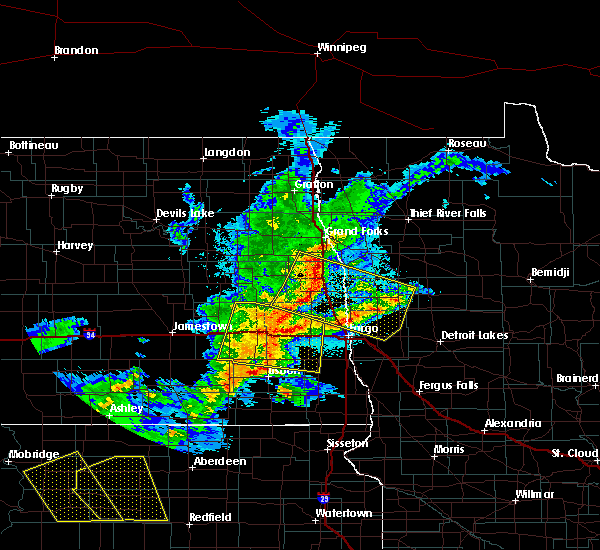 severe thunderstorms will be near, holmes, blanchard and hunter around 400 am cdt. amenia, kelso and reynolds around 410 am cdt. 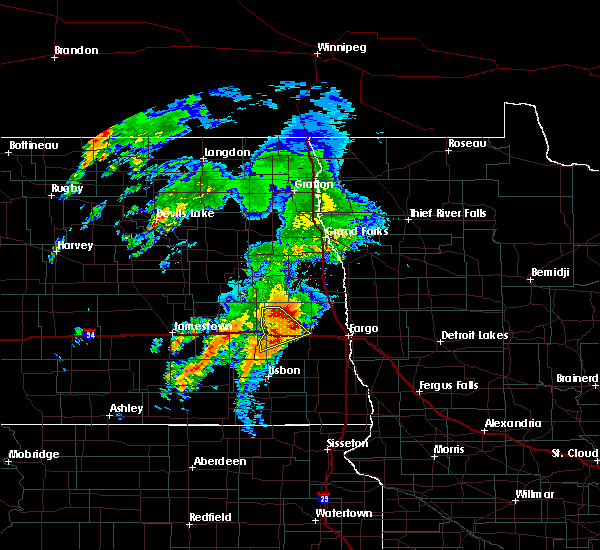 bygland around 415 am cdt. hendrum, prosper and halstad around 420 am cdt. brooktree park, harwood and eldred around 425 am cdt. other locations impacted by these severe thunderstorms include west argusville and american crystal sugar. This includes interstate 29 between mile markers 70 and 131. 6/6/2018 12:09 AM CDT At 1209 am cdt, severe thunderstorms were located along a line extending from near nielsville to grandin to near arthur, moving southeast at 50 mph (public). Hazards include golf ball size hail and 70 mph wind gusts. People and animals outdoors will be injured. expect hail damage to roofs, siding, windows, and vehicles. expect considerable tree damage. wind damage is also likely to mobile homes, roofs, and outbuildings. locations impacted include, ada, hillsboro, glyndon, twin valley, harwood, halstad and ulen. This includes interstate 29 between mile markers 72 and 125. 6/5/2018 11:56 PM CDT At 1156 pm cdt, severe thunderstorms were located along a line extending from near buxton to near blanchard to near erie, moving southeast at 50 mph (radar indicated). Hazards include 70 mph wind gusts and quarter size hail. Hail damage to vehicles is expected. expect considerable tree damage. Wind damage is also likely to mobile homes, roofs, and outbuildings. 6/5/2018 11:22 PM CDT At 1122 pm cdt, severe thunderstorms were located along a line extending from near kempton to sherbrooke to near luverne, moving southeast at 50 mph (radar indicated). Hazards include 70 mph wind gusts and quarter size hail. Hail damage to vehicles is expected. expect considerable tree damage. wind damage is also likely to mobile homes, roofs, and outbuildings. 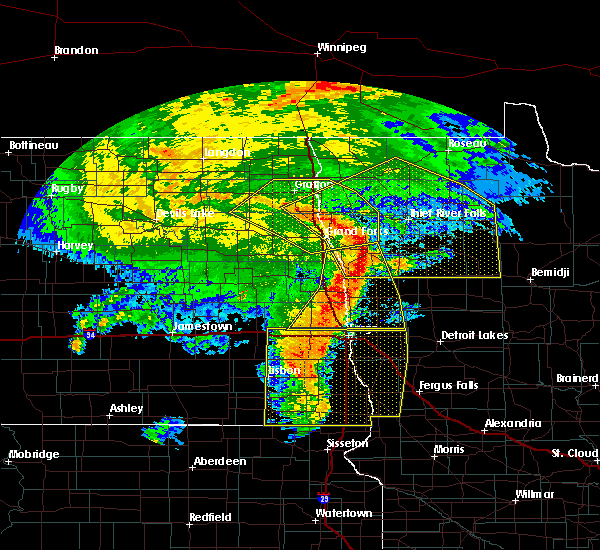 severe thunderstorms will be near, hope around 1130 pm cdt. colgate and holmes around 1135 pm cdt. clifford and roseville around 1140 pm cdt. page and galesburg around 1145 pm cdt. buxton, reynolds and blanchard around 1150 pm cdt. other locations impacted by these severe thunderstorms include american crystal sugar. This includes interstate 29 between mile markers 91 and 124. 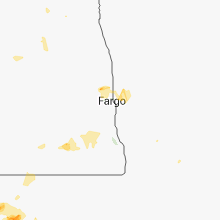 9/19/2017 6:20 PM CDT At 619 pm cdt, a severe thunderstorm was located near arthur, or 19 miles northwest of fargo, moving northeast at 30 mph (radar indicated). Hazards include 60 mph wind gusts and quarter size hail. Hail damage to vehicles is expected. expect wind damage to roofs, siding, and trees. this severe storm will be near, argusville around 630 pm cdt. gardner around 635 pm cdt. georgetown around 645 pm cdt. perley around 650 pm cdt. hendrum around 655 pm cdt. other locations impacted by this severe thunderstorm include west argusville. this includes interstate 29 between mile markers 74 and 96. 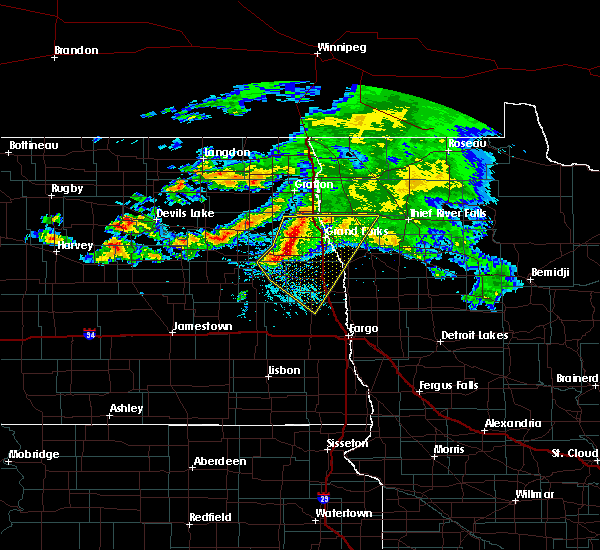 A tornado watch remains in effect until midnight cdt for northwestern minnesota, and southeastern north dakota. 9/19/2017 5:56 PM CDT At 555 pm cdt, a severe thunderstorm was located near absaraka, or 25 miles west of fargo, moving east at 30 mph (radar indicated). Hazards include 60 mph wind gusts and quarter size hail. Hail damage to vehicles is expected. expect wind damage to roofs, siding, and trees. 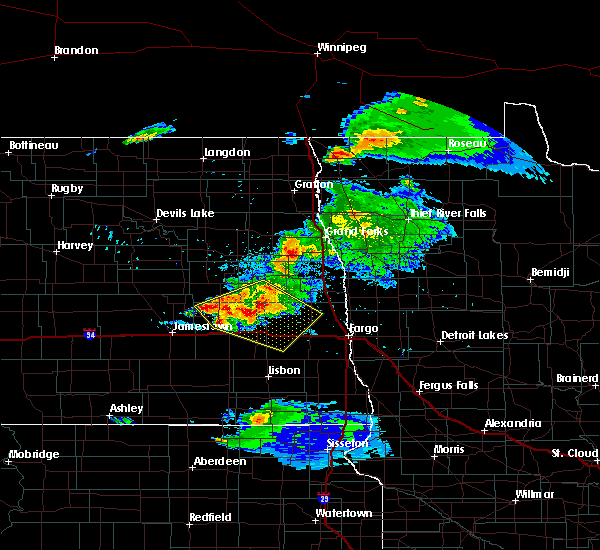 this severe thunderstorm will be near, casselton around 600 pm cdt. amenia around 605 pm cdt. arthur around 610 pm cdt. prosper around 620 pm cdt. argusville around 630 pm cdt. 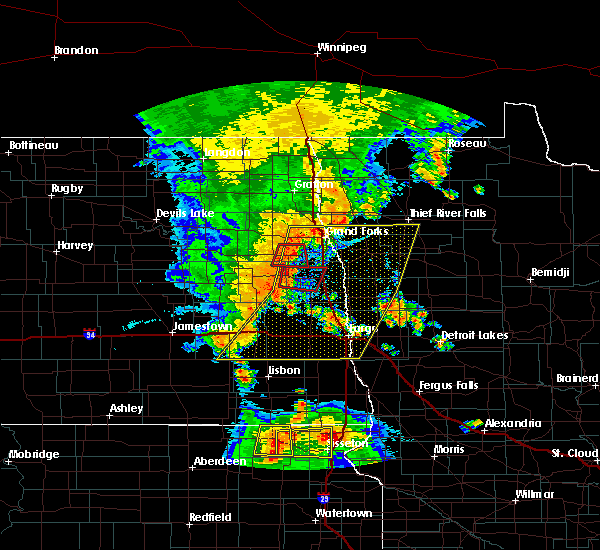 other locations impacted by this severe thunderstorm include moorhead airport, west argusville and casselton airport. this includes the following highways, interstate 29 between mile markers 62 and 96. interstate 94 in north dakota between mile markers 320 and 352. interstate 94 in minnesota between mile markers 1 and 7. A tornado watch remains in effect until midnight cdt for northwestern minnesota, and southeastern north dakota. 7/31/2017 9:05 PM CDT At 902 pm cdt, severe thunderstorms were located along a line extending from near hendrum to hunter to page to just south of pillsbury, moving south at 25 mph. out ahead of the rain is an area of gusty north winds that will push south ahead of this system with wind speeds up to 40 mph. 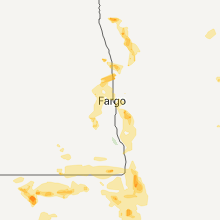 these winds may arrive into parts of the fargo area 915 to 930 pm (radar indicated). Hazards include 60 mph wind gusts and half dollar size hail. Hail damage to vehicles is expected. expect wind damage to roofs, siding, and trees. locations impacted include, hillsboro, arthur, hunter, hope, page, grandin and galesburg. This includes interstate 29 between mile markers 80 and 110. 7/31/2017 8:50 PM CDT At 850 pm cdt, severe thunderstorms were located along a line extending from halstad to near pillsbury, moving south at 40 mph (radar indicated). Hazards include 60 mph wind gusts and half dollar size hail. Hail damage to vehicles is expected. expect wind damage to roofs, siding, and trees. locations impacted include, hillsboro, arthur, hunter, hope, page, grandin and galesburg. This includes interstate 29 between mile markers 80 and 110. 7/31/2017 8:31 PM CDT At 830 pm cdt, severe thunderstorms were located along a line extending from near nielsville to luverne, moving southeast at 25 mph (radar indicated). Hazards include quarter size hail. Damage to vehicles is expected. 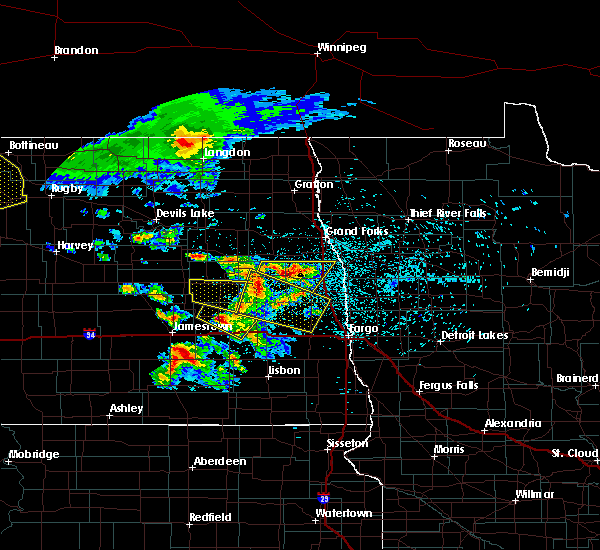 severe thunderstorms will be near, caledonia and clifford around 835 pm cdt. other locations impacted by these severe thunderstorms include american crystal sugar. This includes interstate 29 between mile markers 80 and 110. 7/22/2017 2:46 AM CDT At 245 am cdt, severe thunderstorms were located along a line extending from near halstad to near amenia, moving southeast at 50 mph (public). Hazards include 60 mph wind gusts. Expect damage to roofs, siding, and trees. 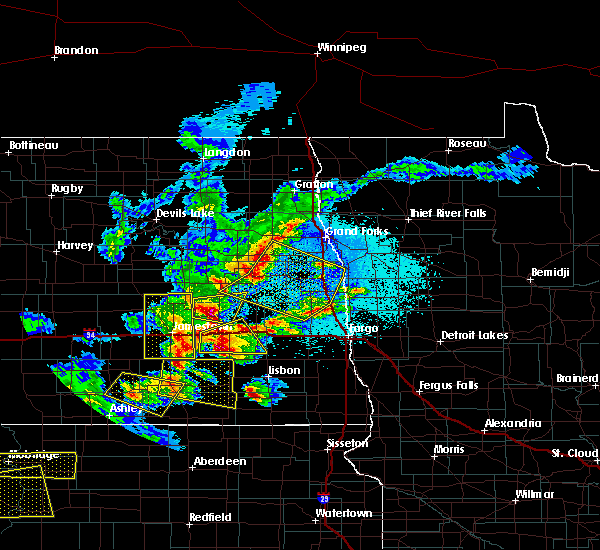 these severe storms will be near, halstad and hendrum around 250 am cdt. hadler around 255 am cdt. ada and prosper around 300 am cdt. 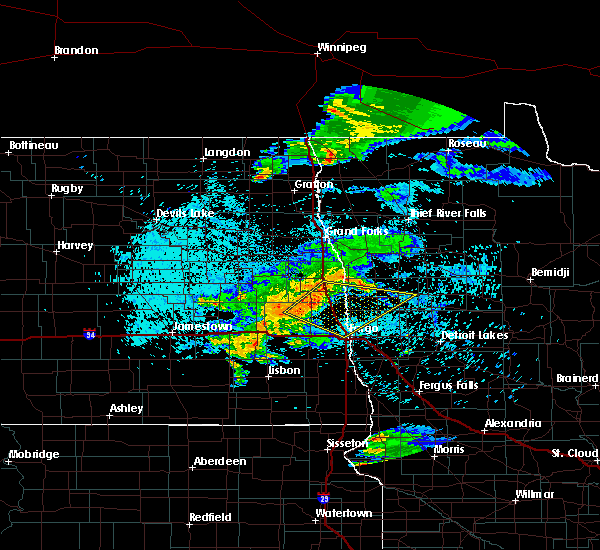 borup, argusville and brooktree park around 305 am cdt. reile`s acres, west fargo and harwood around 310 am cdt. other locations impacted by these severe thunderstorms include west argusville. This includes interstate 29 between mile markers 65 and 96. 7/22/2017 2:37 AM CDT At 236 am cdt, severe thunderstorms were located along a line extending from near caledonia to near erie, moving southeast at 50 mph (radar indicated). Hazards include 60 mph wind gusts. Expect damage to roofs, siding, and trees. 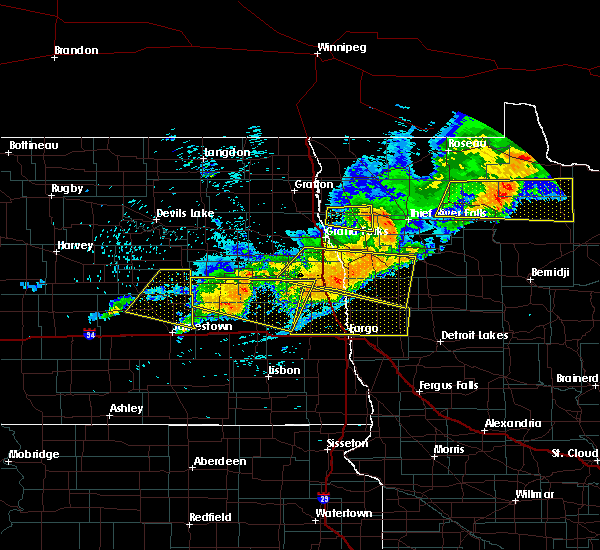 severe thunderstorms will be near, halstad around 240 am cdt. 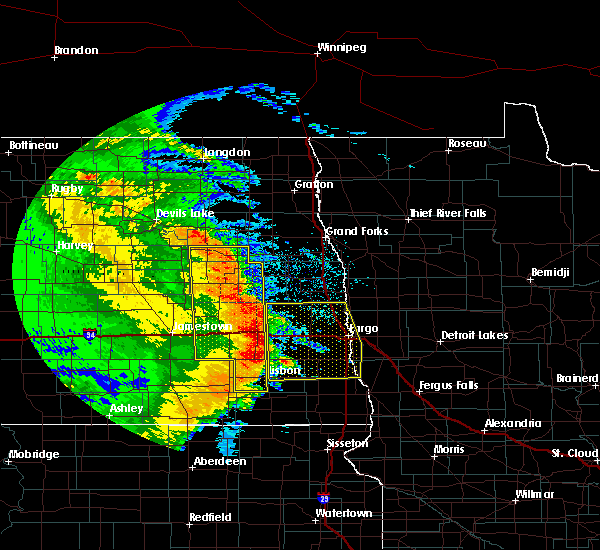 arthur and hendrum around 245 am cdt. hadler around 255 am cdt. ada and prosper around 300 am cdt. borup and brooktree park around 305 am cdt. other locations impacted by these severe thunderstorms include west argusville and american crystal sugar. This includes interstate 29 between mile markers 65 and 108. 7/21/2017 4:34 PM CDT At 433 pm cdt, a severe thunderstorm was located near blanchard, or 38 miles south of grand forks, moving east at 55 mph (radar indicated. 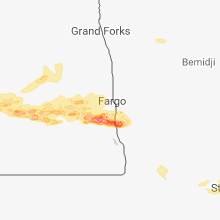 at 422 pm cdt, 53 mph wind was reported at hope nd). Hazards include 60 mph wind gusts and quarter size hail. Hail damage to vehicles is expected. expect wind damage to roofs, siding, and trees. this severe storm will be near, blanchard around 435 pm cdt. hillsboro and kelso around 445 pm cdt. 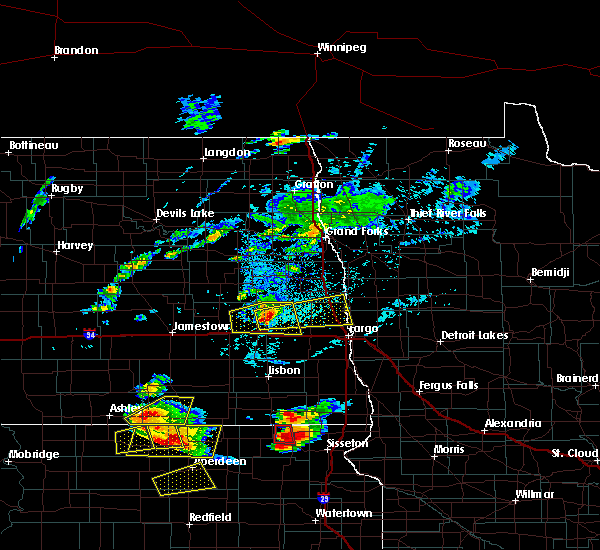 halstad, shelly and hendrum around 455 pm cdt. other locations impacted by this severe thunderstorm include american crystal sugar. This includes interstate 29 between mile markers 82 and 122. 7/21/2017 4:10 PM CDT At 409 pm cdt, a severe thunderstorm was located over hope, or 33 miles northeast of valley city, moving east at 50 mph (radar indicated). Hazards include 60 mph wind gusts and quarter size hail. Hail damage to vehicles is expected. expect wind damage to roofs, siding, and trees. 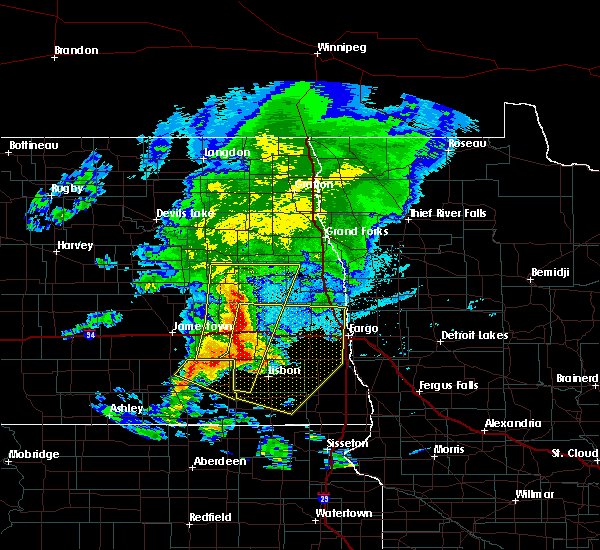 this severe thunderstorm will be near, galesburg, clifford and roseville around 425 pm cdt. blanchard around 435 pm cdt. hillsboro and kelso around 445 pm cdt. grandin around 450 pm cdt. halstad around 455 pm cdt. other locations impacted by this severe thunderstorm include american crystal sugar. This includes interstate 29 between mile markers 82 and 122. 7/6/2017 2:12 AM CDT The severe thunderstorm warning for northeastern cass, southern traill and central steele counties will expire at 215 am cdt, the storm which prompted the warning has weakened below severe limits, and no longer pose an immediate threat to life or property. therefore the warning will be allowed to expire. a severe thunderstorm watch remains in effect until 500 am cdt for northwestern minnesota, and southeastern north dakota. 7/6/2017 2:02 AM CDT At 201 am cdt, a severe thunderstorm was located near galesburg, or 36 miles northwest of fargo, moving southeast at 40 mph (radar indicated). Hazards include 60 mph wind gusts and quarter size hail. Hail damage to vehicles is expected. expect wind damage to roofs, siding, and trees. this severe storm will be near, blanchard around 205 am cdt. hunter around 210 am cdt. 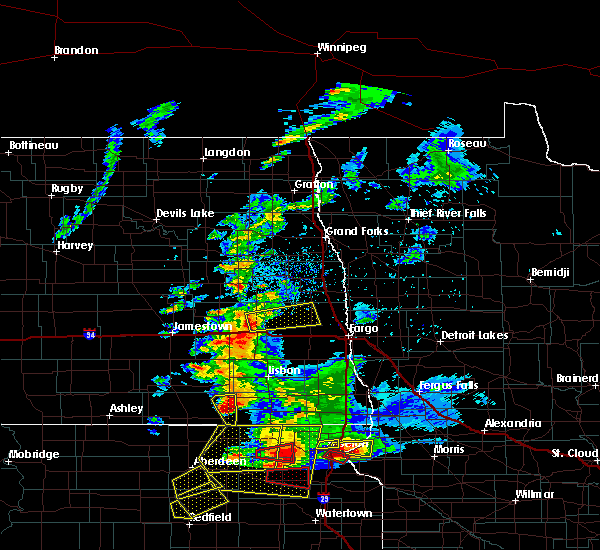 grandin around 215 am cdt. This includes interstate 29 between mile markers 77 and 100. 7/6/2017 1:31 AM CDT At 131 am cdt, a severe thunderstorm was located over finley, or 39 miles north of valley city, moving southeast at 30 mph (radar indicated). Hazards include 60 mph wind gusts and half dollar size hail. Hail damage to vehicles is expected. expect wind damage to roofs, siding, and trees. 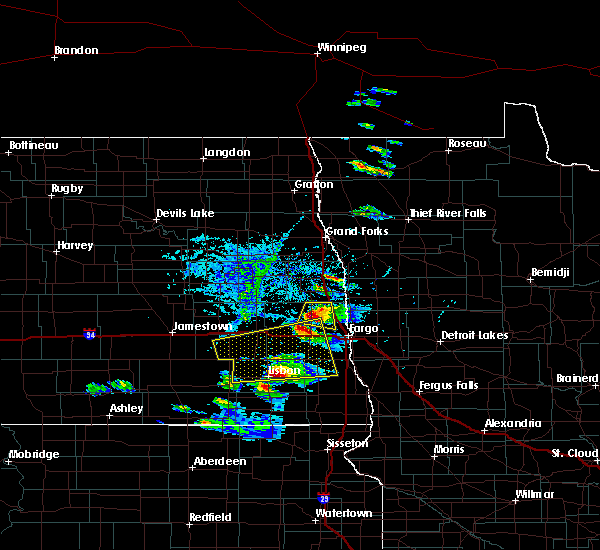 this severe storm will be near, sherbrooke around 145 am cdt. 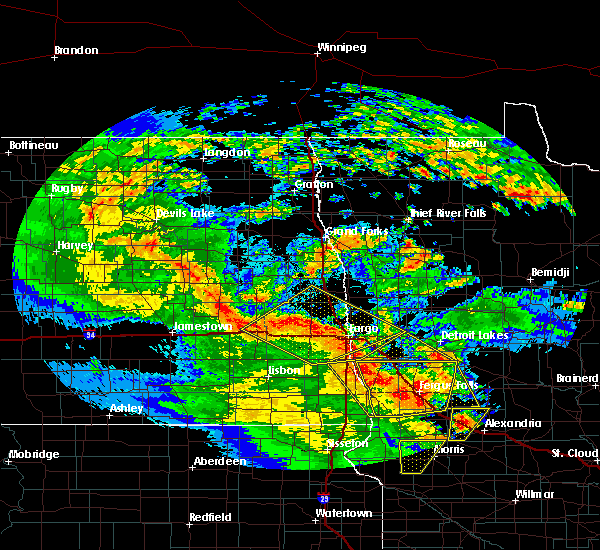 galesburg, clifford and roseville around 215 am cdt. This includes interstate 29 between mile markers 77 and 115. 7/6/2017 1:11 AM CDT At 111 am cdt, a severe thunderstorm was located over sharon, or 44 miles southwest of grand forks, moving southeast at 30 mph (radar indicated). Hazards include 60 mph wind gusts and quarter size hail. Hail damage to vehicles is expected. expect wind damage to roofs, siding, and trees. 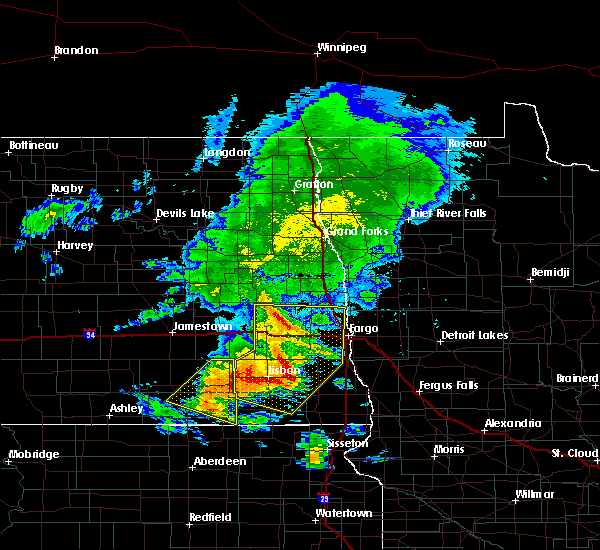 this severe thunderstorm will be near, finley around 120 am cdt. 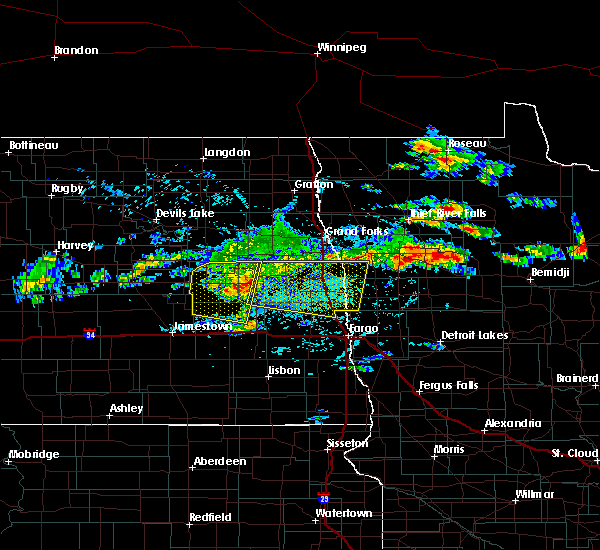 golden lake and sherbrooke around 130 am cdt. 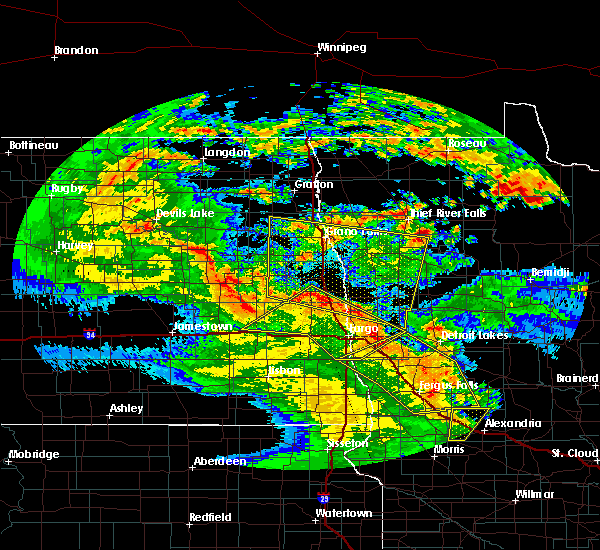 roseville around 200 am cdt. 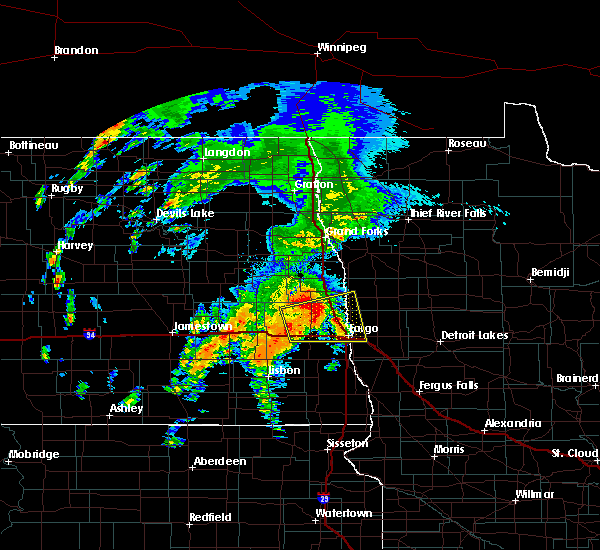 clifford around 205 am cdt. 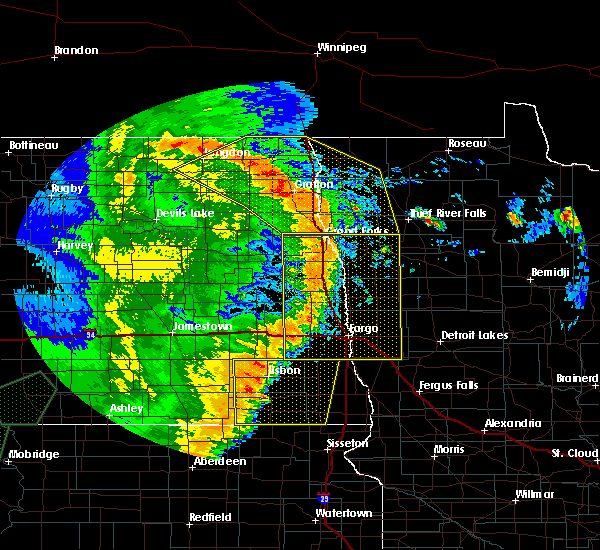 galesburg around 210 am cdt. This includes interstate 29 between mile markers 77 and 115. 7/6/2017 12:46 AM CDT At 1246 am cdt, a severe thunderstorm was located over sherbrooke, or 39 miles north of valley city, moving southeast at 20 mph (radar indicated). Hazards include ping pong ball size hail and 60 mph wind gusts. People and animals outdoors will be injured. expect hail damage to roofs, siding, windows, and vehicles. expect wind damage to roofs, siding, and trees. this severe storm will be near, sherbrooke around 1255 am cdt. This includes interstate 29 between mile markers 93 and 94. 7/6/2017 12:34 AM CDT At 1234 am cdt, a severe thunderstorm was located near clifford, or 39 miles northeast of valley city, moving east at 30 mph (radar indicated). Hazards include 60 mph wind gusts and quarter size hail. Hail damage to vehicles is expected. expect wind damage to roofs, siding, and trees. this severe storm will be near, galesburg and clifford around 1245 am cdt. blanchard around 100 am cdt. This includes interstate 29 between mile markers 93 and 94. 7/6/2017 12:09 AM CDT At 1208 am cdt, a severe thunderstorm was located over blabon, or 32 miles north of valley city, moving east at 40 mph (radar indicated). Hazards include ping pong ball size hail and 60 mph wind gusts. People and animals outdoors will be injured. expect hail damage to roofs, siding, windows, and vehicles. expect wind damage to roofs, siding, and trees. this severe thunderstorm will be near, sherbrooke around 1210 am cdt. 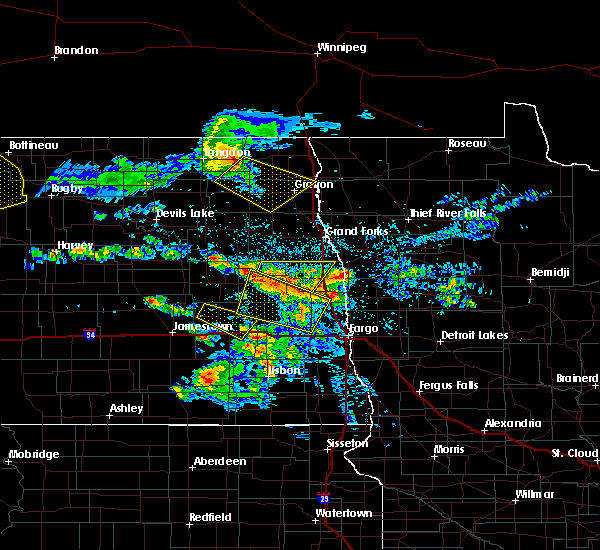 hope around 1215 am cdt. colgate around 1220 am cdt. 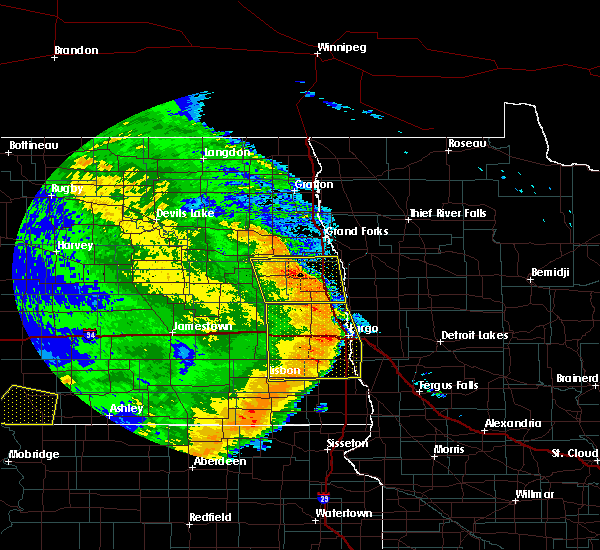 clifford around 1235 am cdt. 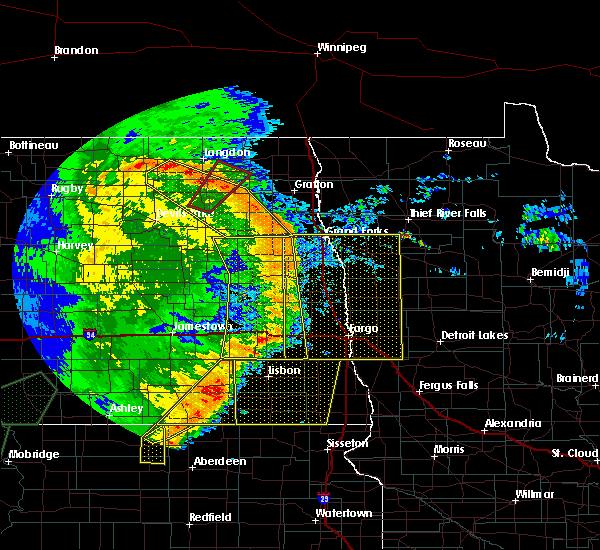 galesburg around 1240 am cdt. This includes interstate 29 between mile markers 93 and 94. 7/4/2017 11:18 PM CDT At 1118 pm cdt, a severe thunderstorm was located near gardner, or 20 miles northwest of fargo, moving east at 30 mph (radar indicated). Hazards include ping pong ball size hail and 60 mph wind gusts. People and animals outdoors will be injured. expect hail damage to roofs, siding, windows, and vehicles. expect wind damage to roofs, siding, and trees. this severe storm will be near, gardner around 1125 pm cdt. argusville around 1130 pm cdt. This includes interstate 29 between mile markers 77 and 96. 7/4/2017 10:43 PM CDT At 1043 pm cdt, a severe thunderstorm was located near galesburg, or 34 miles northwest of fargo, moving east at 20 mph (radar indicated). Hazards include 70 mph wind gusts and ping pong ball size hail. People and animals outdoors will be injured. expect hail damage to roofs, siding, windows, and vehicles. expect considerable tree damage. wind damage is also likely to mobile homes, roofs, and outbuildings. 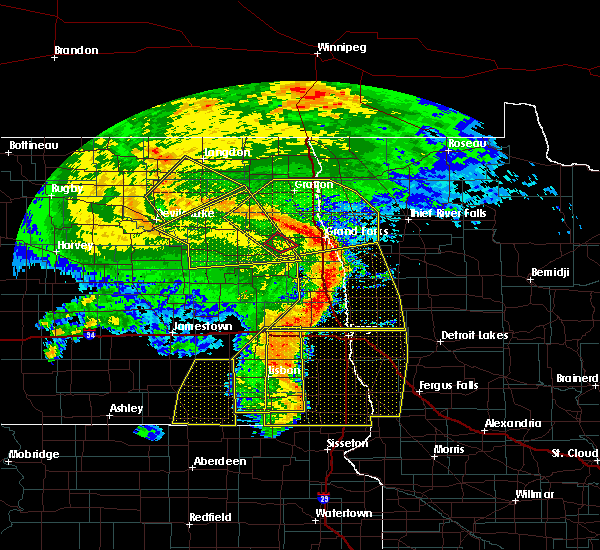 this severe thunderstorm will be near, hunter and arthur around 1105 pm cdt. 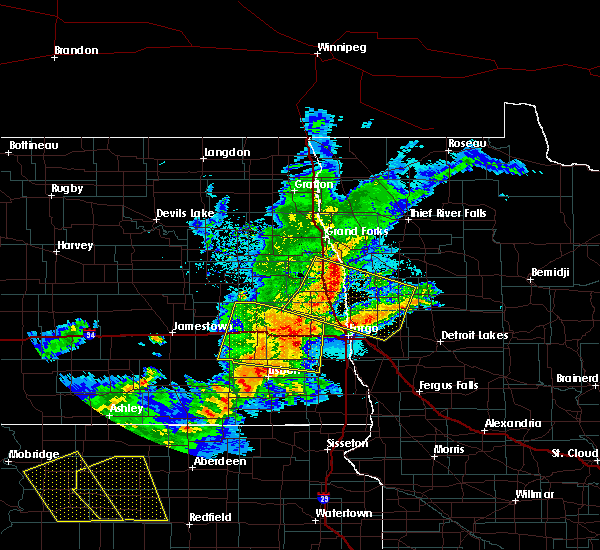 grandin around 1130 pm cdt. gardner around 1140 pm cdt. This includes interstate 29 between mile markers 77 and 96. 7/4/2017 8:41 PM CDT At 841 pm cdt, severe thunderstorms were located along a line extending from near thompson to near clifford, moving south at 45 mph (radar indicated). Hazards include 60 mph wind gusts and quarter size hail. Hail damage to vehicles is expected. Expect wind damage to roofs, siding, and trees. 6/13/2017 9:24 PM CDT At 923 pm cdt, severe thunderstorms were located along a line extending from near clifford to near borup, moving north at 60 mph (radar indicated). Hazards include 60 mph wind gusts and penny size hail. Expect damage to roofs, siding, and trees. 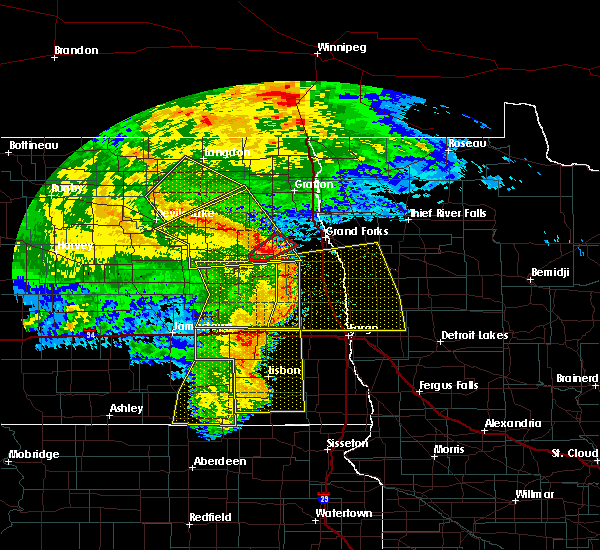 severe thunderstorms will be near, clifford around 925 pm cdt. 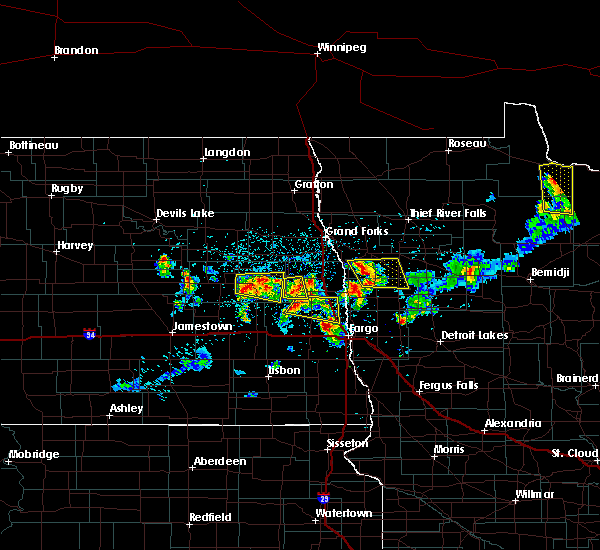 twin valley and roseville around 930 pm cdt. ada, portland and golden lake around 935 pm cdt. gary, hadler and lockhart around 940 pm cdt. hatton and flaming around 945 pm cdt. This includes interstate 29 between mile markers 85 and 153. 8/27/2016 7:10 PM CDT At 710 pm cdt, severe thunderstorms were located along a line extending from hadler to near hendrum to grandin, moving east at 25 mph (radar indicated). Hazards include 60 mph wind gusts and quarter size hail. Hail damage to vehicles is expected. expect wind damage to roofs, siding, and trees. these severe storms will be near, ada and hadler around 715 pm cdt. This includes interstate 29 between mile markers 82 and 102. 8/27/2016 6:53 PM CDT At 653 pm cdt, severe thunderstorms were located along a line extending from near halstad to near grandin to near hunter, moving southeast at 20 mph (radar indicated). Hazards include golf ball size hail and 60 mph wind gusts. People and animals outdoors will be injured. expect hail damage to roofs, siding, windows, and vehicles. expect wind damage to roofs, siding, and trees. 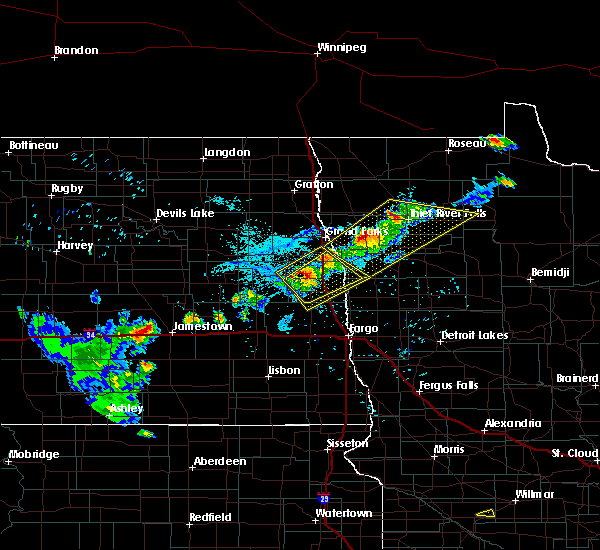 these severe storms will be near, grandin around 700 pm cdt. hendrum around 705 pm cdt. 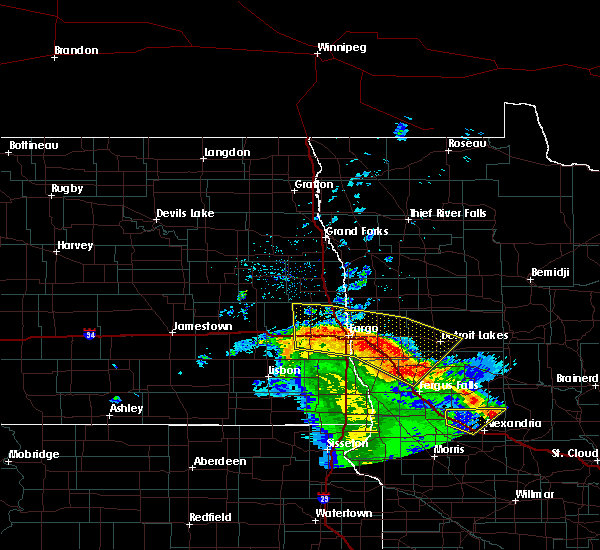 hadler around 710 pm cdt. 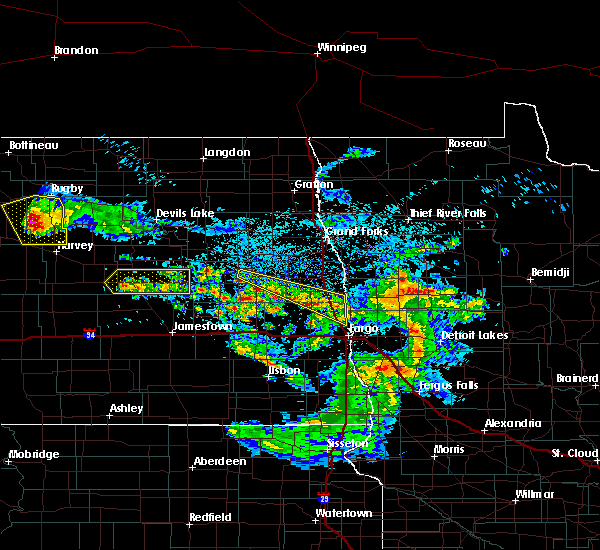 arthur, ada and perley around 720 pm cdt. This includes interstate 29 between mile markers 82 and 104. 8/27/2016 6:26 PM CDT At 625 pm cdt, severe thunderstorms were located along a line extending from nielsville to near hillsboro to blanchard, moving southeast at 20 mph (radar indicated). Hazards include golf ball size hail and 60 mph wind gusts. People and animals outdoors will be injured. expect hail damage to roofs, siding, windows, and vehicles. expect wind damage to roofs, siding, and trees. 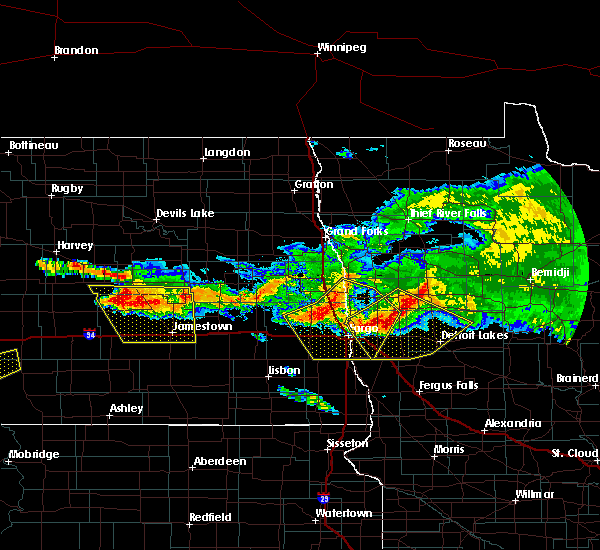 severe thunderstorms will be near, shelly around 635 pm cdt. kelso around 640 pm cdt. 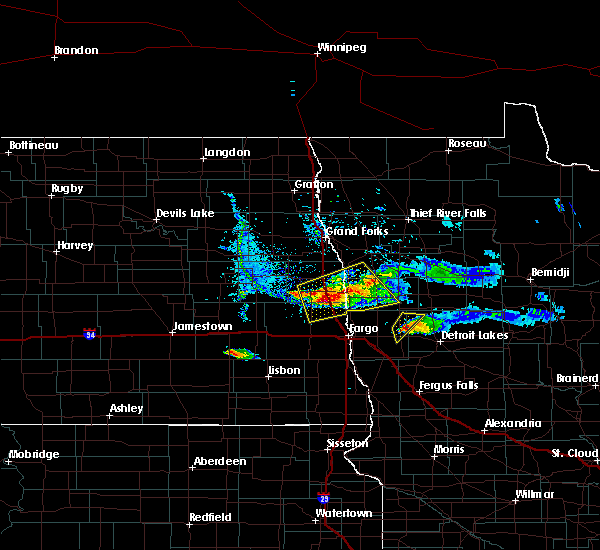 grandin and halstad around 655 pm cdt. hunter around 700 pm cdt. hendrum around 705 pm cdt. This includes interstate 29 between mile markers 82 and 112. 7/21/2016 12:00 AM CDT At 1200 am cdt, severe thunderstorms were located along a line extending from roseville to near ayr, moving east at 55 mph (radar indicated). Hazards include 60 mph wind gusts. Expect damage to roofs. siding. and trees. severe thunderstorms will be near, absaraka and blanchard around 1210 am cdt. amenia around 1215 am cdt. 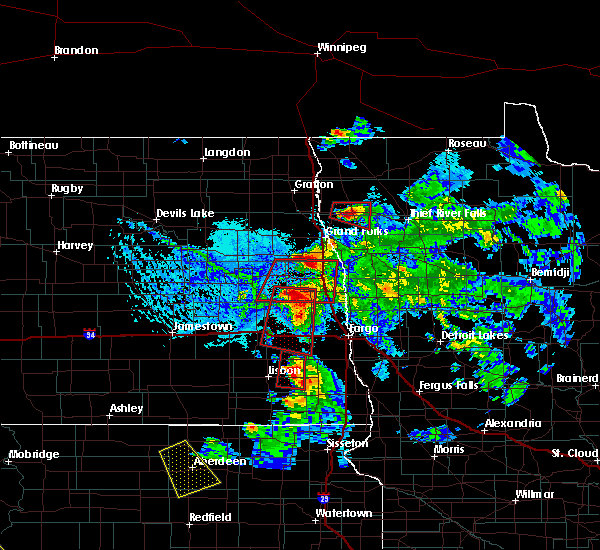 kelso around 1220 am cdt. 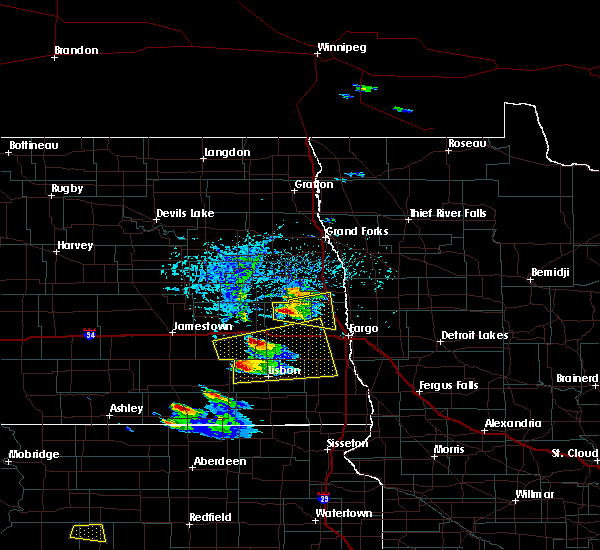 hendrum and prosper around 1230 am cdt. reile`s acres, harwood and brooktree park around 1235 am cdt. Also includes interstate 29 between mile markers 67 and 101. 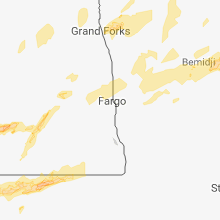 7/20/2016 11:36 PM CDT At 1135 pm cdt, a severe thunderstorm was located near grandin, or 29 miles north of fargo, moving southeast at 55 mph (radar indicated). Hazards include 60 mph wind gusts and penny size hail. Expect damage to roofs. siding. and trees. this severe thunderstorm will be near, gardner around 1145 pm cdt. argusville and perley around 1150 pm cdt. georgetown, harwood and brooktree park around 1155 pm cdt. 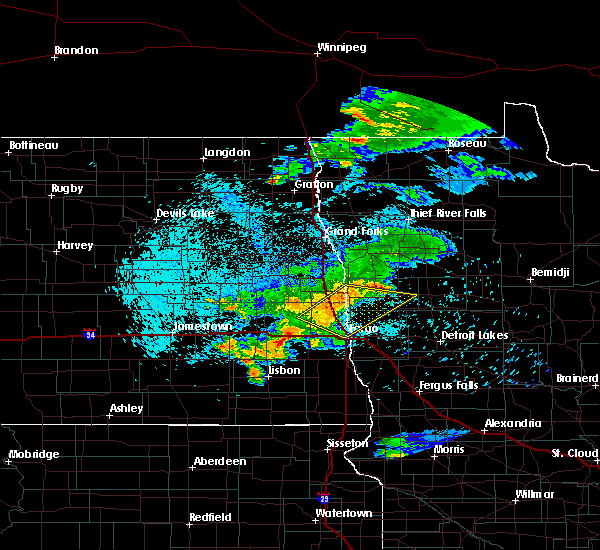 northeastern fargo, kragnes and north river around 1200 am cdt. 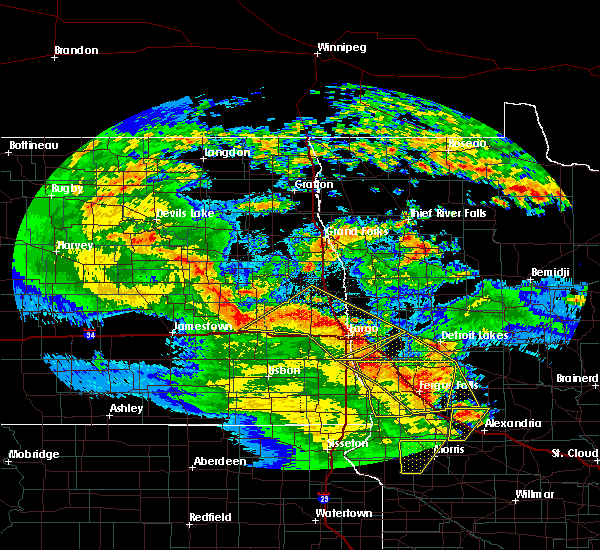 oakport and moorhead around 1205 am cdt. Also includes interstate 29 between mile markers 67 and 103. 7/11/2016 12:53 AM CDT At 1252 am cdt, severe thunderstorms were located along a line extending from near hunter to near west fargo to 6 miles west of colfax, moving east at 50 mph (radar indicated). Hazards include 70 mph wind gusts. Expect considerable tree damage. damage is likely to mobile homes, roofs, and outbuildings. storm spotter 64 mph wind gust 2 miles ese of mapleton at 1246 am. 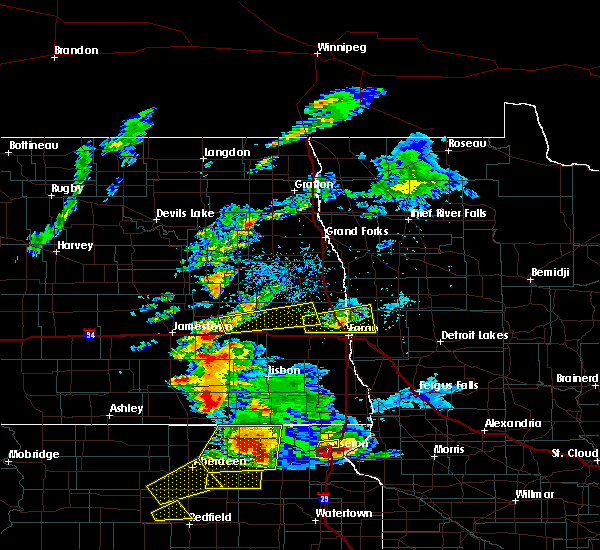 these severe storms will be near, fargo, west fargo and reile`s acres around 1255 am cdt. 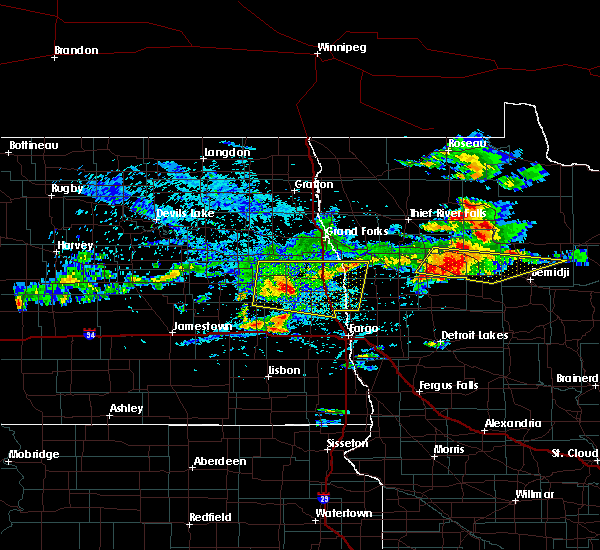 colfax, frontier and moorhead around 100 am cdt. 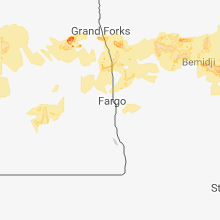 also includes the following highways, interstate 29 between mile markers 35 and 92. interstate 94 in north dakota between mile markers 308 and 352. Interstate 94 in minnesota between mile markers 1 and 4. 7/11/2016 12:40 AM CDT At 1239 am cdt, severe thunderstorms were located along a line extending from near galesburg to near casselton to 7 miles southwest of barrie, moving east at 65 mph (radar indicated). Hazards include 70 mph wind gusts and half dollar size hail. Hail damage to vehicles is expected. expect considerable tree damage. wind damage is also likely to mobile homes, roofs, and outbuildings. 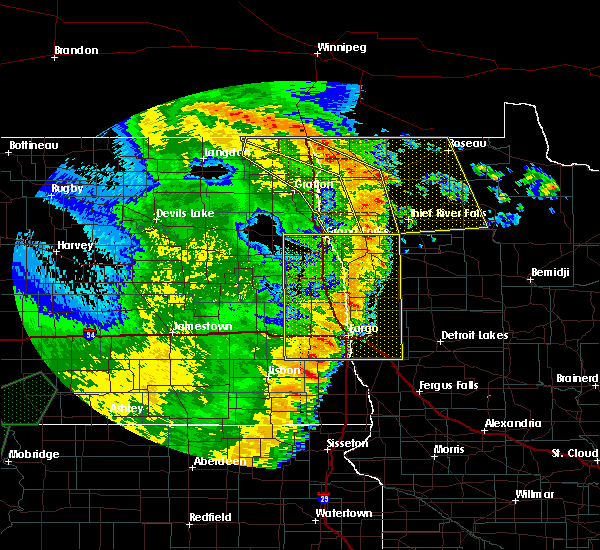 storm spotters reported a peak wind of 60 mph 3 west of casselton along i-94 at 1235 am. these severe storms will be near, mapleton, barrie and prosper around 1245 am cdt. 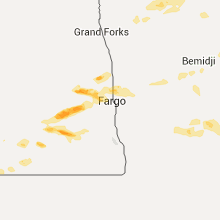 west fargo, walcott and reile`s acres around 1250 am cdt. 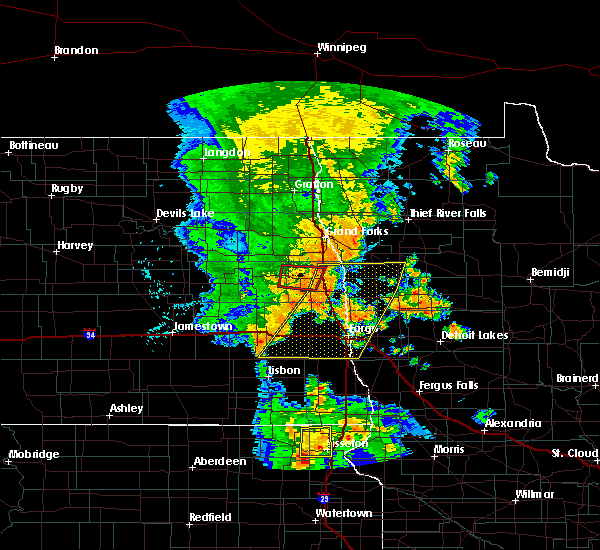 fargo, colfax and grandin around 1255 am cdt. 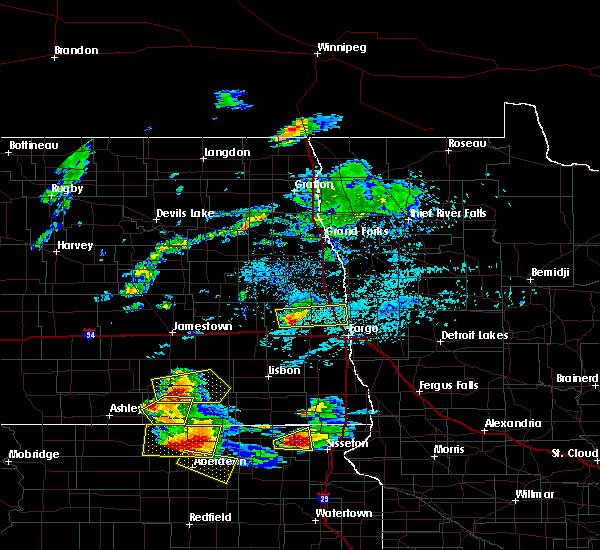 dilworth, abercrombie and moorhead around 100 am cdt. also includes the following highways, interstate 29 between mile markers 35 and 92. interstate 94 in north dakota between mile markers 308 and 352. Interstate 94 in minnesota between mile markers 1 and 4. 7/11/2016 12:13 AM CDT At 1212 am cdt, severe thunderstorms were located along a line extending from luverne to near tower city to 6 miles northwest of lisbon, moving east at 50 mph (radar indicated). Hazards include 70 mph wind gusts and half dollar size hail. Hail damage to vehicles is expected. expect considerable tree damage. wind damage is also likely to mobile homes, roofs, and outbuildings. severe thunderstorms will be near, tower city around 1215 am cdt. buffalo around 1220 am cdt. 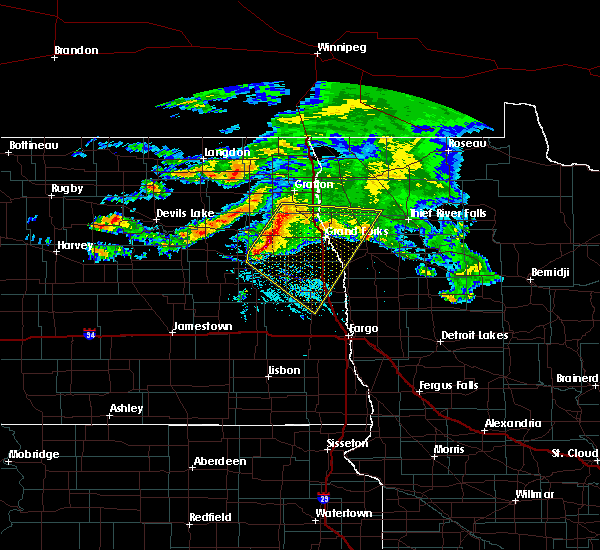 sheldon around 1225 am cdt. 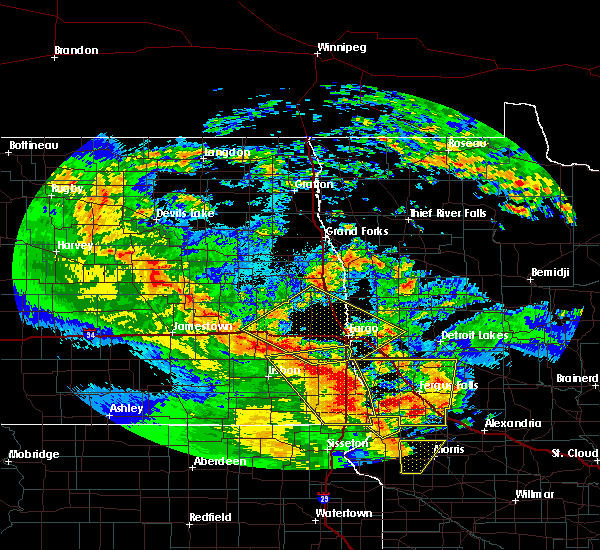 venlo, anselm and wheatland around 1230 am cdt. page and chaffee around 1235 am cdt. fargo around 1255 am cdt. also includes the following highways, interstate 29 between mile markers 35 and 92. interstate 94 in north dakota between mile markers 308 and 352. Interstate 94 in minnesota between mile markers 1 and 4. 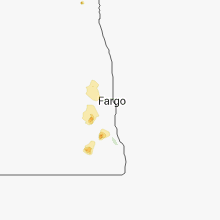 7/9/2016 9:48 PM CDT At 947 pm cdt, a severe thunderstorm was located near blanchard, or 34 miles northwest of fargo, moving southeast at 35 mph (radar indicated). Hazards include 70 mph wind gusts and quarter size hail. Hail damage to vehicles is expected. expect considerable tree damage. wind damage is also likely to mobile homes, roofs, and outbuildings. 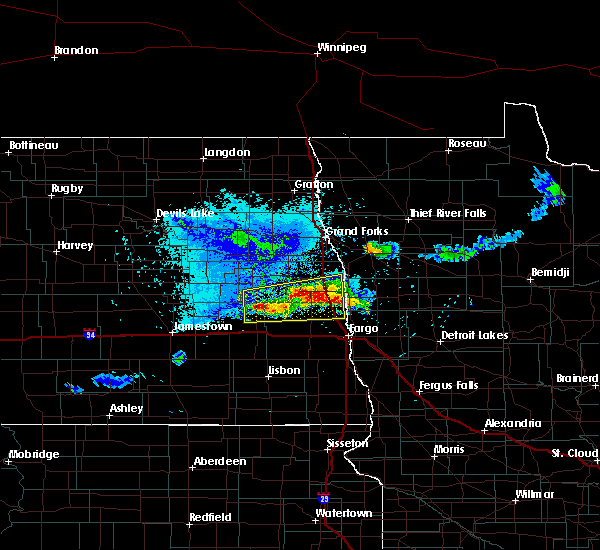 this severe storm will be near, hunter and kelso around 955 pm cdt. grandin around 1005 pm cdt. gardner around 1015 pm cdt. Also includes interstate 29 between mile markers 84 and 114. 7/9/2016 9:30 PM CDT At 929 pm cdt, a severe thunderstorm was located over roseville, or 37 miles south of grand forks, moving southeast at 35 mph (radar indicated). Hazards include 60 mph wind gusts and quarter size hail. Hail damage to vehicles is expected. expect wind damage to roofs, siding, and trees. this severe thunderstorm will be near, blanchard around 945 pm cdt. hunter around 955 pm cdt. 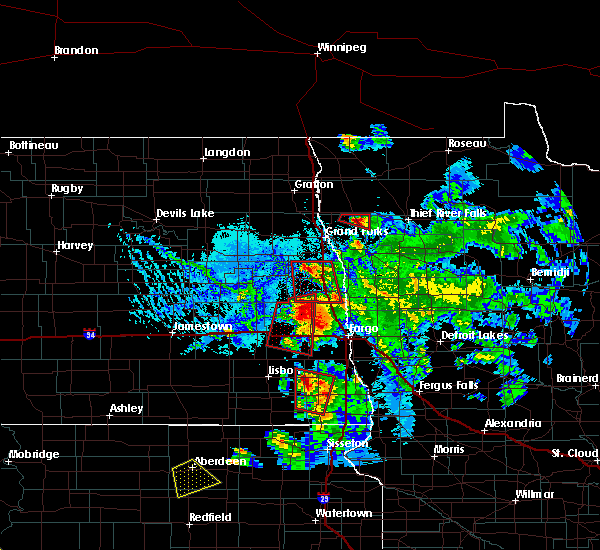 kelso around 1000 pm cdt. grandin around 1005 pm cdt. hendrum and gardner around 1015 pm cdt. Also includes interstate 29 between mile markers 84 and 115. 7/9/2016 8:31 PM CDT At 830 pm cdt, a severe thunderstorm was located near cummings, or 29 miles south of grand forks, moving southeast at 35 mph (trained weather spotters. 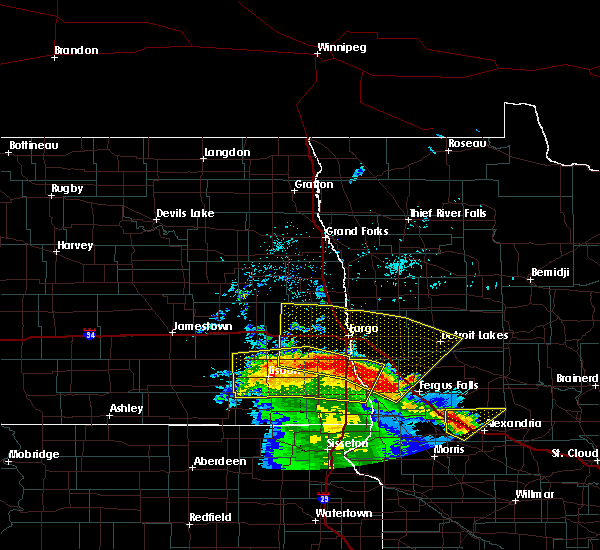 at 820 pm...ping pong size hail was reported near buxton). Hazards include golf ball size hail and 60 mph wind gusts. People and animals outdoors will be injured. expect hail damage to roofs, siding, windows, and vehicles. expect wind damage to roofs, siding, and trees. this severe thunderstorm will be near, hillsboro around 845 pm cdt. 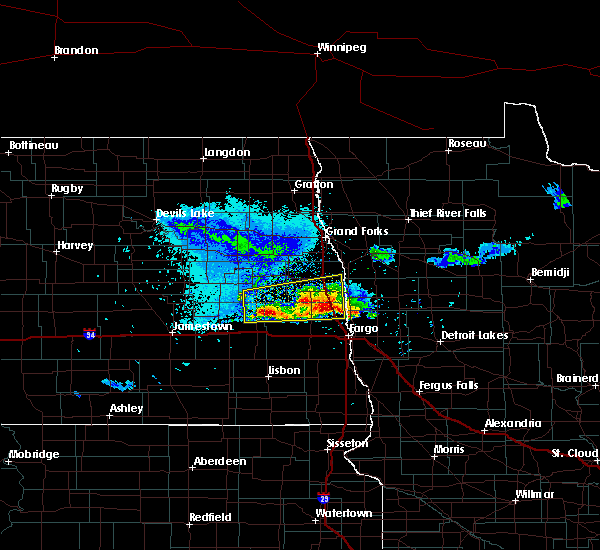 kelso and caledonia around 850 pm cdt. 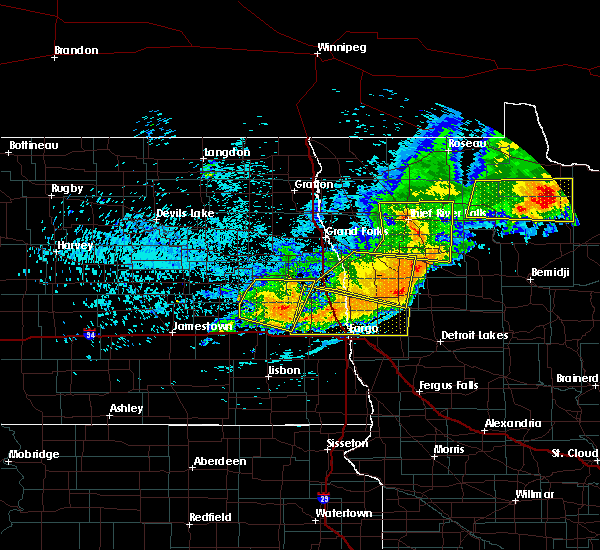 halstad and grandin around 900 pm cdt. hendrum around 905 pm cdt. Also includes interstate 29 between mile markers 80 and 125. 7/9/2016 8:03 PM CDT At 802 pm cdt, severe thunderstorms were located along a line extending from near manvel to holmes to near hatton, moving southeast at 40 mph (public. at 755 pm...egg size hail was reported in northwood). Hazards include two inch hail and 60 mph wind gusts. People and animals outdoors will be injured. expect hail damage to roofs, siding, windows, and vehicles. expect wind damage to roofs, siding, and trees. 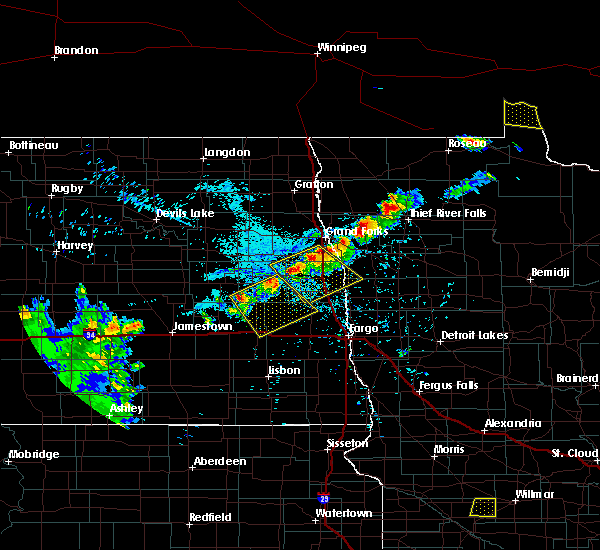 these severe storms will be near, portland around 810 pm cdt. 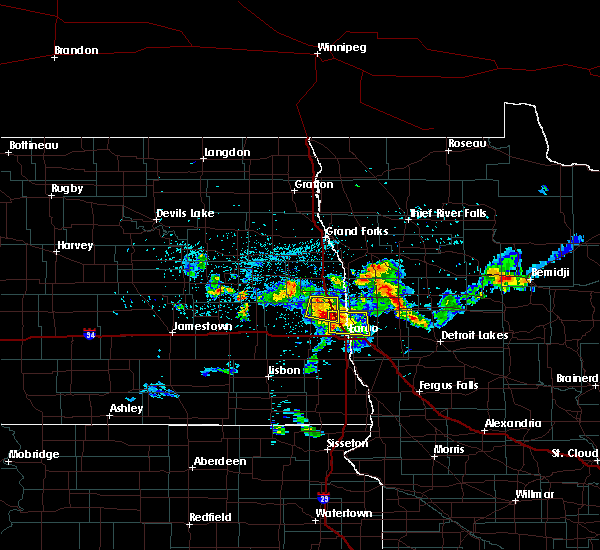 mayville, reynolds and east grand forks around 815 pm cdt. buxton around 820 pm cdt. mallory, cummings and sherack around 825 pm cdt. hillsboro, fisher and key west around 830 pm cdt. Also includes interstate 29 between mile markers 99 and 158. 7/9/2016 7:57 PM CDT At 756 pm cdt, severe thunderstorms were located along a line extending from manvel to near holmes to near hatton, moving southeast at 35 mph (public. at 750 pm...golf ball size hail was reported in northwood). Hazards include golf ball size hail and 60 mph wind gusts. People and animals outdoors will be injured. expect hail damage to roofs, siding, windows, and vehicles. expect wind damage to roofs, siding, and trees. 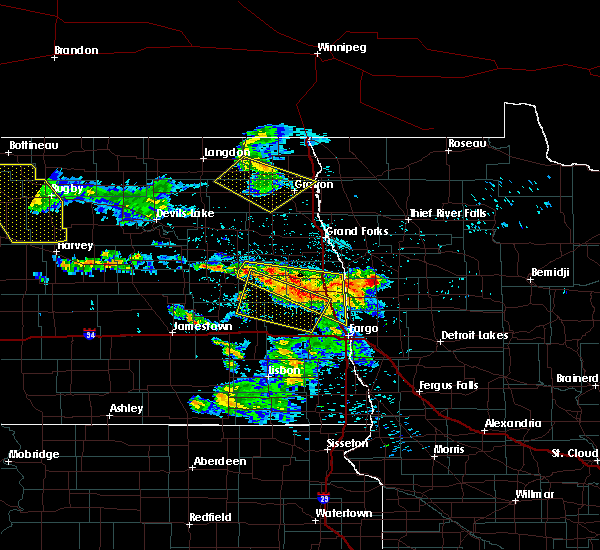 these severe storms will be near, holmes around 800 pm cdt. 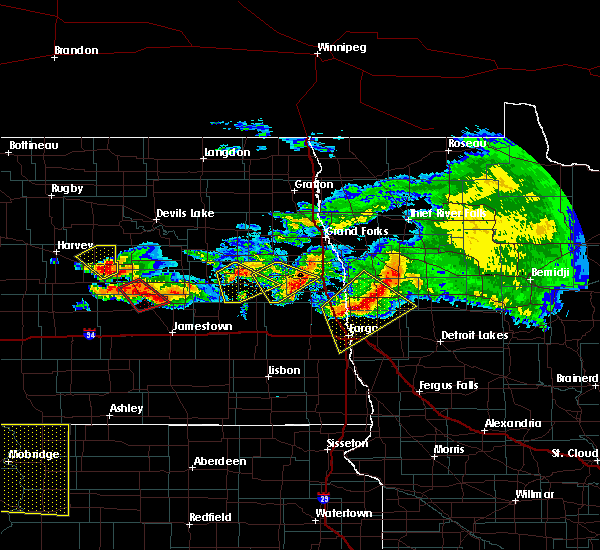 mayville, portland and roseville around 815 pm cdt. 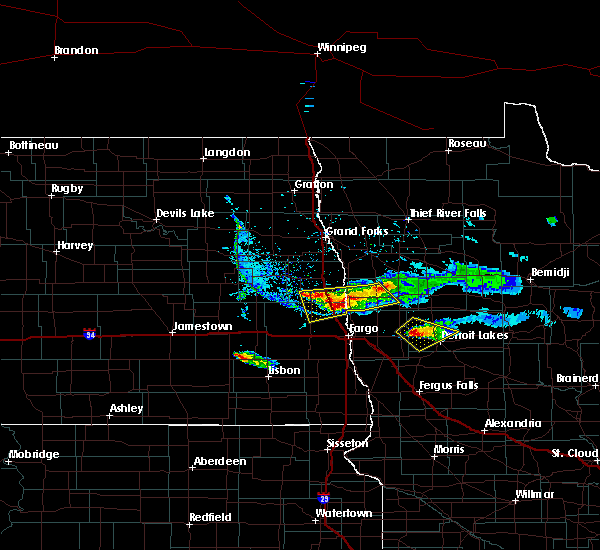 buxton, east grand forks and reynolds around 820 pm cdt. hillsboro, davidson and key west around 830 pm cdt. Also includes interstate 29 between mile markers 99 and 158. 7/9/2016 7:49 PM CDT At 748 pm cdt, severe thunderstorms were located along a line extending from 6 miles southwest of poland to 6 miles east of northwood to near golden lake, moving southeast at 45 mph (public. 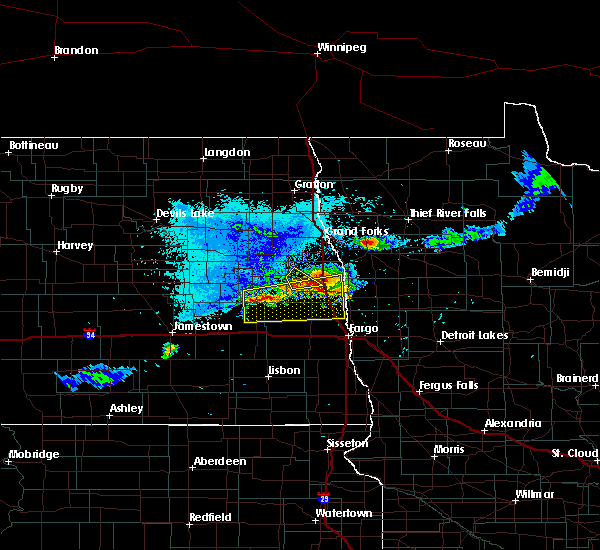 at 740 pm...quarter size hail was reported 3 miles east of larimore). Hazards include golf ball size hail and 60 mph wind gusts. People and animals outdoors will be injured. expect hail damage to roofs, siding, windows, and vehicles. expect wind damage to roofs, siding, and trees. these severe storms will be near, manvel and hatton around 755 pm cdt. holmes around 800 pm cdt. 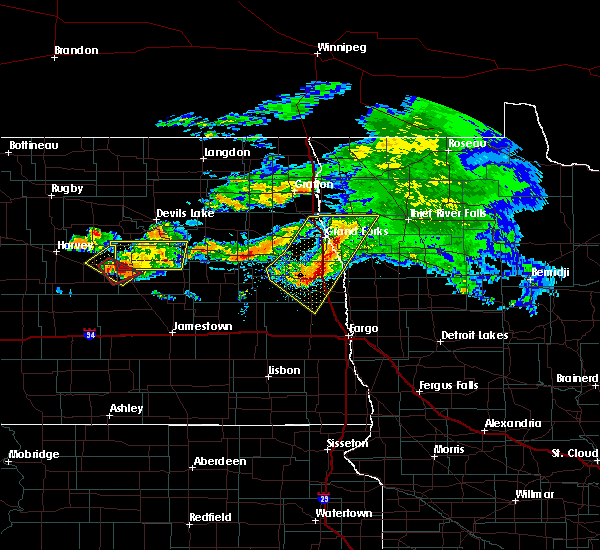 grand forks, portland and mayville around 810 pm cdt. 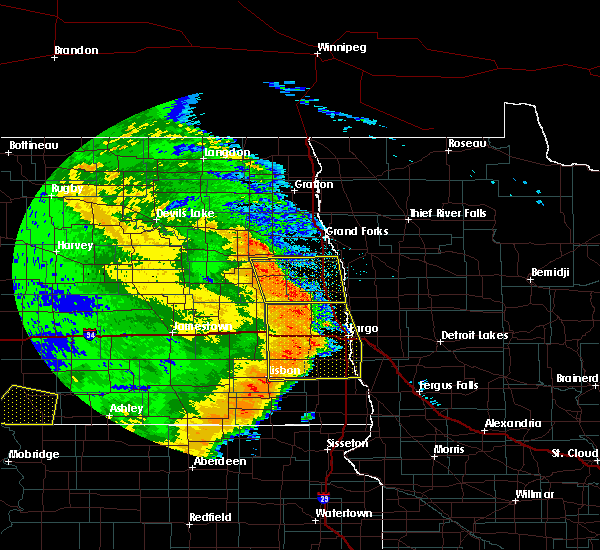 buxton and east grand forks around 815 pm cdt. mallory, cummings and key west around 820 pm cdt. Also includes interstate 29 between mile markers 99 and 158. 7/4/2016 7:03 PM CDT At 702 pm cdt, a severe thunderstorm was located 8 miles southwest of page, or 17 miles northeast of valley city, moving southeast at 40 mph (radar indicated). Hazards include 70 mph wind gusts and quarter size hail. Hail damage to vehicles is expected. expect considerable tree damage. wind damage is also likely to mobile homes, roofs, and outbuildings. this severe storm will be near, tower city and ayr around 715 pm cdt. buffalo around 720 pm cdt. absaraka around 725 pm cdt. wheatland and embden around 730 pm cdt. Also includes interstate 94 in north dakota between mile markers 289 and 324. 7/4/2016 6:38 PM CDT At 638 pm cdt, a severe thunderstorm was located near pillsbury, or 20 miles north of valley city, moving southeast at 50 mph. this is a very dangerous storm (radar indicated). Hazards include 80 mph wind gusts and quarter size hail. Flying debris will be dangerous to those caught without shelter. mobile homes will be heavily damaged. expect considerable damage to roofs, windows, and vehicles. extensive tree damage and power outages are likely. this severe thunderstorm will be near, pillsbury around 640 pm cdt. page around 655 pm cdt. buffalo and ayr around 705 pm cdt. absaraka around 710 pm cdt. wheatland around 715 pm cdt. Also includes interstate 94 in north dakota between mile markers 289 and 324. 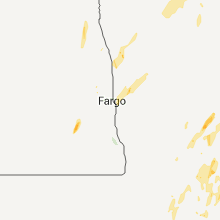 8/7/2015 6:42 PM CDT At 641 pm cdt, a severe thunderstorm was located near arthur, or 21 miles northwest of fargo, moving east at 20 mph (radar indicated). Hazards include half dollar size hail. Damage to vehicles is expected. this severe thunderstorm will be near, gardner around 700 pm cdt. prosper around 705 pm cdt. argusville around 710 pm cdt. harwood and brooktree park around 715 pm cdt. reile`s acres around 720 pm cdt. also includes the following highways, interstate 29 between mile markers 59 and 88. Interstate 94 in north dakota between mile markers 322 and 352. 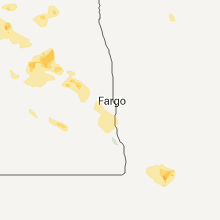 8/7/2015 6:35 PM CDT At 634 pm cdt, a severe thunderstorm was located over arthur, or 23 miles northwest of fargo, moving east at 25 mph (radar indicated). Hazards include half dollar size hail. Damage to vehicles is expected. this severe thunderstorm will remain over mainly rural areas of northeastern cass county. Also includes interstate 29 between mile markers 88 and 91. 8/7/2015 6:01 PM CDT At 601 pm cdt, a severe thunderstorm was located over page, or 28 miles northeast of valley city, moving east at 15 mph (radar indicated). Hazards include half dollar size hail. Damage to vehicles is expected. this severe thunderstorm will be near, galesburg and erie around 615 pm cdt. hunter and arthur around 635 pm cdt. grandin around 645 pm cdt. Also includes interstate 29 between mile markers 89 and 99. 7/17/2015 7:22 PM CDT At 722 pm cdt, a severe thunderstorm was located near oriska, or 12 miles northeast of valley city, moving east at 35 mph (radar indicated). Hazards include 60 mph wind gusts and quarter size hail. Hail damage to vehicles is expected. expect wind damage to roofs, siding and trees. this severe storm will be near, ayr around 745 pm cdt. absaraka and erie around 755 pm cdt. Amenia around 800 pm cdt. 7/17/2015 6:59 PM CDT At 659 pm cdt, a severe thunderstorm was located over bald hill dam, or near valley city, moving east at 35 mph (radar indicated). Hazards include ping pong ball size hail and 60 mph wind gusts. People and animals outdoors will be injured. expect hail damage to roofs, siding, windows and vehicles. expect wind damage to roofs, siding and trees. this severe thunderstorm will be near, valley city around 700 pm cdt. oriska around 715 pm cdt. page and ayr around 740 pm cdt. erie around 750 pm cdt. Arthur and hunter around 800 pm cdt. 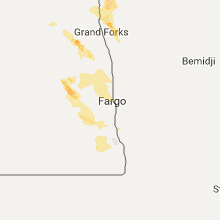 7/17/2015 6:07 PM CDT At 605 pm cdt, a severe thunderstorm was located near erie, or 29 miles northwest of fargo, moving east at 30 mph (public). Hazards include quarter size hail. Damage to vehicles is expected. this severe storm will be near, amenia around 620 pm cdt. Arthur around 625 pm cdt. 7/17/2015 5:37 PM CDT At 537 pm cdt, a severe thunderstorm was located near page, or 20 miles northeast of valley city, moving east at 40 mph (radar indicated). Hazards include half dollar size hail. Damage to vehicles is expected. this severe thunderstorm will be near, page and ayr around 545 pm cdt. erie around 555 pm cdt. arthur around 605 pm cdt. hunter around 610 pm cdt. Grandin, argusville and gardner around 625 pm cdt. 6/27/2015 6:33 PM CDT At 633 pm cdt, a severe thunderstorm capable of producing a tornado was located over erie, or 30 miles northeast of valley city, moving south at 20 mph (radar indicated rotation). Hazards include tornado and quarter size hail. Flying debris will be dangerous to those caught without shelter. mobile homes will be damaged or destroyed. damage to roofs, windows and vehicles will occur. tree damage is likely. this dangerous storm will be near, erie around 635 pm cdt. ayr around 645 pm cdt. Absaraka, wheatland and amenia around 700 pm cdt. 6/27/2015 6:14 PM CDT At 613 pm cdt, a severe thunderstorm capable of producing a tornado was located near page, or 28 miles northeast of valley city, moving south at 45 mph (radar indicated rotation). Hazards include tornado and ping pong ball size hail. Expect damage to mobile homes. roofs and vehicles. this dangerous storm will be near, page around 615 pm cdt. erie around 620 pm cdt. ayr around 630 pm cdt. absaraka around 635 pm cdt. Buffalo and tower city around 640 pm cdt. 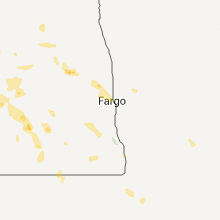 6/2/2015 9:00 PM CDT At 859 pm cdt, a severe thunderstorm was located over hunter, or 27 miles northwest of fargo, moving northeast at 15 mph (radar indicated). Hazards include 60 mph wind gusts and quarter size hail. Hail damage to vehicles is expected. expect wind damage to roofs, siding and trees. 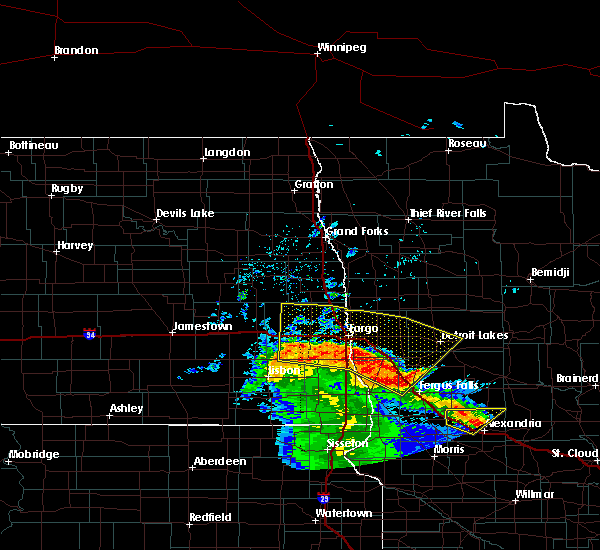 This severe thunderstorm will be near, grandin around 930 pm cdt.